What Is Hot Fusion Yoga? Be ready to sweat if you practice hot fusion yoga. Yoga is clearly a hot activity, with yoga studios popping up across the United States. Of course, some yoga classes are hotter than others -- literally. Hot yoga, as the name suggests, is practiced in a hot room that may exceed 100 degrees Fahrenheit. If you’re looking to drop some weight and you don’t mind sweating, check out hot yoga, or hot fusion yoga, which combines hot yoga with other yoga disciplines. The contents of a hot yoga session will vary with different studios and instructors. The common denominator is the heat. Hot yoga rooms are heated to about 105 degrees Fahrenheit and may also feature higher humidity. The increased heat warms your muscles quickly and should allow practitioners a greater range of motion. The goal is also to remove toxins from the body via the heavy sweating that occurs naturally when you’re working in high heat. As an added bonus, your body burns fat more effectively in higher temperatures. 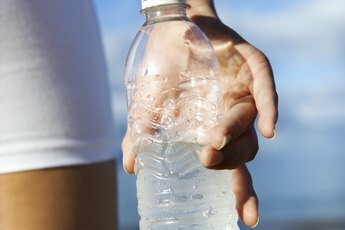 Make sure you’re well hydrated before trying hot yoga for the first time. Fusion yoga combines the best of two or more yoga styles. Hot fusion typically combines standard hot yoga with another discipline, such as Vinyasa or Power yoga. For example, if hot yoga is combined with a strength-building yoga style, the heat helps the students perform more strenuous maneuvers, thereby building more strength. Other hot yoga fusion instructors may simply wish to add the detox or weight-loss benefits of hot yoga to another yoga discipline. Who Can Perform Hot Fusion? Unless a class is designated for advanced students, less-experienced yoga practitioners will typically be welcome at a hot fusion class. Nevertheless, beginners may wish to learn hot yoga first before advancing to hot fusion. Standard hot yoga classes perform a sequence of 26 postures. Fusion classes add even more poses to the mix, so you’ll be in a better position to keep up with a hot fusion class if you’re already comfortable with the basic hot yoga routine. The increased range of motion you can achieve in a hot, humid environment is generally a plus for your yoga practice because you can achieve positions you might not ordinarily be able to complete. You then reap the benefits that the more challenging positions provide. But don’t stretch your muscles beyond their limits, or you may do more harm than good. If you’re new to hot or hot fusion yoga, you may wish to begin with a less-challenging routine, to test yourself, or start with a class in which the temperature remains below 100 F.
Can Hot Yoga Aggravate High Blood Pressure? How Often Should You Do Yoga a Week?